As people rush to pack in their holiday shopping, card-writing, and party-planning, nonprofit teams have only one thing on their minds: the last stretch of fundraising for year-end campaigns. While it’s important to keep your head in the game when you near the end of any campaign, it’s absolutely critical when it comes to your year-end fundraising efforts. Not only does your campaign take place during one of the most powerful fundraising months, but a good chunk of all donations comes in during the last three days of the year. So, while you’ve been promoting your campaign non-stop up to this point, it’s time to kick it up a notch. Here are five steps you can take to power through the final days of your year-end campaign. You’ve been sending out email appeals all month, but at this point, you worry you might fatigue your donors. Then again, you still have to lock in those end-of-year gifts. Enter the soft-ask. To give donors some breathing room between all of your hard asks, send an email at the start of the week that includes a subtle or “soft” ask. The focus of your email should be on thanking donors or sharing year-end impact stories, but then you can hyperlink to your donate page or include a donate button in the footer. In the example below, Walk With Sally recently emailed supporters with an annual impact infographic to celebrate the success of 2017, but also took the opportunity to ask for donations so that the organization can continue to grow. 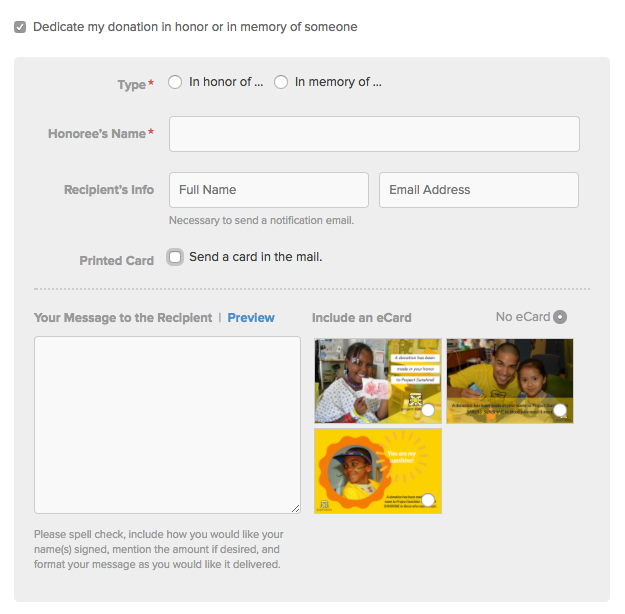 An eCard allows a donor to share the goodwill they experience when making a donation. Rather than receiving a note that a donation was made in their honor, the dedicatee gets a personalized, stylized eCard for a much more meaningful and delightful experience. If you haven’t already done so, invest an hour or two to create an eCard to add to your Classy donation page. Project Sunshine includes several options here, but you only need to create one if you’re short on time. Don’t forget to promote your eCard option as a holiday gift for those hard-to-please friends and family. 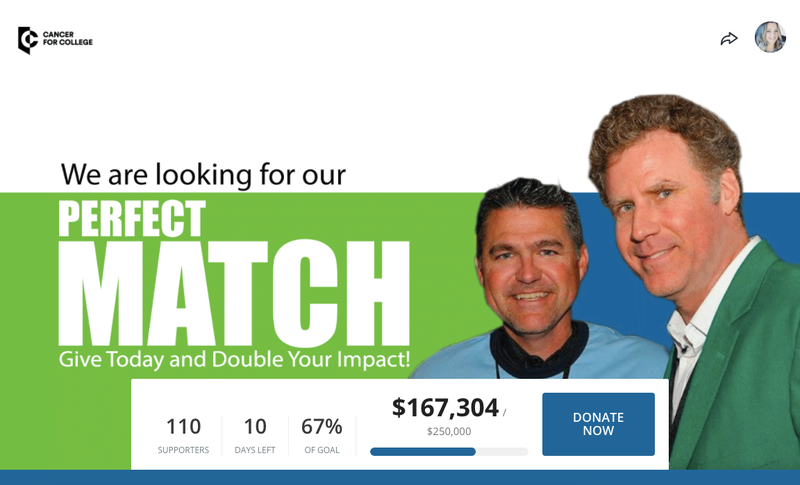 If there’s one thing donors like more than making an impact, it’s the ability to double it. Now’s the time to promote your donation matching campaigns at full throttle. Announce them in your email campaigns and on social media. If you don’t have any matching campaigns in the works, consider bringing your team together to brainstorm any last-minute sponsorship options. With 12 percent of donations coming in during the last three days of the year, this is the best time to strap down a match campaign—even if it only lasts for a few hours. Think about whether you have any corporate partners or large donors who might be willing to sponsor a donation match during the final days of December. For example, Will Ferrell recently pledged to match every donation made to Cancer for College, up to $250,000, through the month of December. Check out their campaign page below. Your final email appeals are some of the most critical messages in your entire campaign. You want to heighten the sense of urgency as December draws to a close, so plan a few emails to go out at the end of this week. As a starting point, aim for three emails around the last two days of December. On December 30, send an email counting down the days left to make a tax-deductible gift (e.g. “2 days left to make your 2017 tax-deductible donation!”). On December 31, send out two (or three) emails—one in the morning and another later in the day. These are your urgent last-minute reminders for supporters to make their donations. 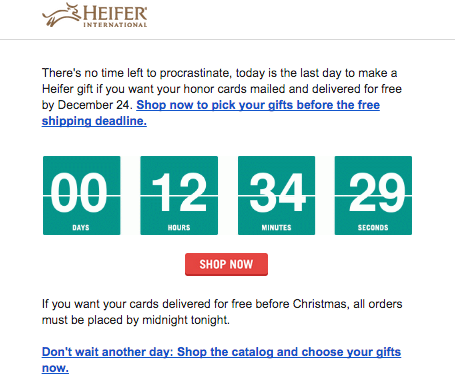 To ramp up the sense of urgency, you can even include a graphic or GIF that counts down the remaining time to make a contribution, like this countdown timer Heifer International included in one of their emails. This is a screenshot, but the actual graphic showed each second ticking down, ramping up the feeling that time was running out. Remember to remove people from your email appeals once they make a donation. Otherwise, you’ll give off the impression you’re not paying attention to their support, and you risk losing their trust or having them hit the unsubscribe button. If you’re leveraging peer-to-peer fundraising this season, reach out one last time to your fundraisers. Send an email thanking and celebrating supporters for their efforts up to this point, and then inform them that this is the final stretch; the heightened sense of urgency will motivate people to boost their efforts. If you have the resources, take the time to call your power fundraisers to share your goal progress. This individualized outreach can refresh their enthusiasm to help close out a solid year. Invite your heavy-hitters to help give your campaign one final push. To make it easier for them, send them templates for last-minute email appeals they can send to their friends and family. Include any stories, photos, or videos that will help them motivate their networks to give. Also, remind fundraisers that if they haven’t done so already, they can kick off some campaign momentum by donating to their own page first. We know it’s been a long couple of months, but stay strong through these last weeks. These final days are potentially the most important of your entire year. Make sure you plan your day-to-day strategy. What emails are you sending out, and when? Are you focusing on engagement on social media? Are you making any phone calls, and if so, when? These are just a few of the questions to ask yourself as you lock down your game plan for the next week. It’s time to cross the finish line strong. It’s important to always push your fundraising campaigns to a strong finish, but it’s absolutely crucial when dealing with a year-end campaign. This is a time of year when people are most apt to donate, and a large percentage of your annual donations will come in during the final week.